Here at Atom we enjoy challenges. Anything from improving a client’s PPC campaign to canoeing across Scotland. 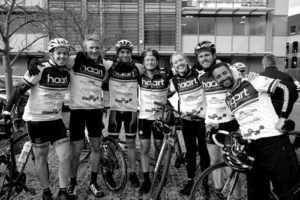 Therefore, when one of our clients, haart, asked us if we’d like to support their charity Magic Moments by riding from London to Colchester (70 miles), we clearly had to say yes! There were 7 brave Atoms willing to take on the challenge, which started on a cold Saturday morning in Clapham. After a quick prep talk our group lead out across London, with around 30 further people from haart following shortly behind. As I am sure anyone who has cycled through London is well aware, it was slow going for the first 10 miles or so. 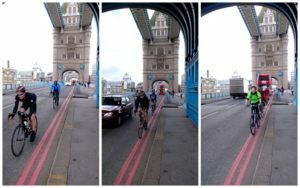 However, cycling through London does have some magic about it, including riding over Tower Bridge. A couple of hours of cycling later, we got out into the idyllic and better-suited for cycling countryside, with rolling hills and quiet roads. After a quick water and sugar break we noticed the hills starting to get steeper and longer. Fortunately, with the help of Alex physically pushing us up the hills we all made it to lunch! Some cheeky Atoms even squeezed in a beer before heading back out. However, at this point the challenge really started to set in when we realised we were only just over half way! The afternoon consisted of learning group riding techniques which was quite amusing. We even started to get a bit competitive trying to race other groups to the end. 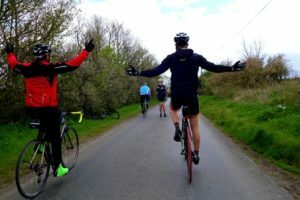 We then met the rest of the riders on the outskirts of Colchester so that we could all finish together. It was a great feeling to all cycle in together and the welcome from the haart staff was something else! There was even champagne! Magic Moments raised well over £60,000 from the event and we were honoured to be a part of it.